House Bill 615 Referred to Senate! On Friday, May 21, 2004 Governor Rendell approved House Bill 832 amending Title 18 (Crimes and Offenses) of the Pennsylvania Consolidated Statutes. You can NOT tattoo or pierce any person under the age of 18 without the consent of the parent or guardian and they MUST BE PRESENT during the application of such tattoo or piercing! First offense is considered a misdemeanor of the third degree, a second or subsequent offense within one year of the first is considered a second degree misdemeanor. This takes in effect in 60 DAYS from the date of enactment! While "parental/guardian consent" is not clearly defined, you would be wise to require photo identification (and/or birth certificate) from both parties, make photocopies of such indentification and require both parties to complete a waiver/liability form and a parental consent form. Keep all of these documents on file. You should also require photo identification and a waiver/liability form from all customers! General waiver forms and parental consent forms are available for you to use as a guideline. Keep in mind that the State will not notify each shop individually. The media and professional organizations such as this are the only methods of notification! Please contact us, or your local legislators with any further questions. Additionally, House Bill 615 was passed in the House on April 13th and forwarded to the Senate Committee on Public Health and Welfare. You should make every effort to contact your local Senator, as well as any of the members of the Public Health and Welfare committee to voice your concerns with this legislation. Letters are great, email is available for most Senators as well! Use the links below to view the text for these bills, either as html files, or as printable Acrobat PDF files. Use the link to the Pennsylvania General Assembly site to track this legislation, contact your Senator or Representative, or learn more abou the legislative process. House Bill 832 - Now Act 36! Keep track of this legislation at the PA General Assembly Site. What is a coalition? A coalition is a group or groups of people united for a common cause. Putting differences of opinion and political agendas aside, members of a coalition agree on one issue and form a group to support or oppose issues that affect the entire group. The Pennsylvania Coalition of Professional Tattooists & Body Piercers was formed in response to OVER-RESTRICTIVE legislation proposed by the Pennsylvania State Senate (Senate Bill 847) and House of Representatives (House Bill 332). In both instances, legislation went beyond sterilization and safety issues (which are important to us all) and incorporated items and language that would make tattooing and/or piercing in certain situations a CRIME! Monitor legislative activities (on a local, state and federal level) as they pertain to the tattooing and piercing profession to prevent undue regulation. Provide a forum for tattooists and body piercers to openly discuss all issues related to our profession. Ensure the preservation of tattooing and body piercing as an artform. How Can I Become Involved? When it comes to governmental issues, being educated and a registered voter are your two most important steps! As a Supporting Member of the Pennsylvania Coalition of Professional Tattooists & Body Piercers you will receive our monthly newsletter and other periodic mailings to keep you informed and updated about the tattooing and piercing professions and related legislative issues. 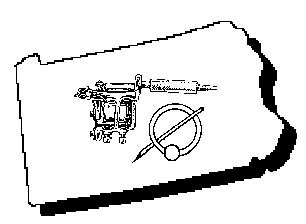 This membership is available to tattooing and/or piercing enthusiasts from the state of Pennsylvania for an annual fee of $20. Professional memberships are available to qualified individuals. Remember, in strength there is unity and together we can ensure that tattooing and piercing remains safe, legal and enjoyable as it has since the beginning of time! Note: Adobe Acrobat Reader and Plug-In Needed for the following Downloads.